Creating a resort setting on your outdoor property is ideal if your family would like to spend lots of time in the swimming pool and enjoy entertaining in a leisurely setting. When planning a new inground pool, you can have your builder integrate a fun, functional, attractive swim-up bar into the overall design. 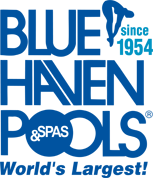 What is a pool swim-up bar and what does it include? 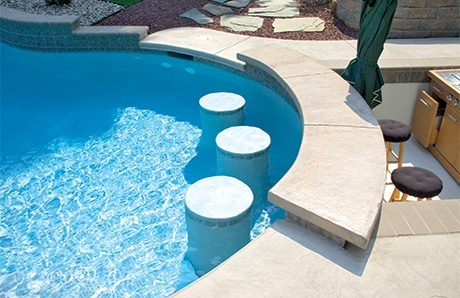 Typically, the configuration incorporates two to five barstools that are permanently built into the pool floor. The top—or seat—portion of each stool is positioned below the water. Depending on a person’s height, those using a stool have the lower half of their body in the water and the upper half outside and above the surface. This arrangement makes it easy to hold drinks or food at the counter in front of them. Your bar’s countertops can be straight or curved. A popular design approach is to cover its exterior with decorative tile or stone that coordinates with materials used elsewhere in the pool. In some cases, homeowners opt for materials and color choices that provide a strong visual contrast to the rest of the pool design—making the bar a dramatic focal point in the backyard. To help block the sun’s rays, you may want to include a shade structure. Examples include a pergola or pavilion, and they can also be as simple as a large patio umbrella. Some swim-up bar configurations are more elaborate. They include dry areas with not only a serving area but a complete outdoor kitchen with appliances for cooking and keeping drinks chilled. Some even boast an outdoor TV monitor. 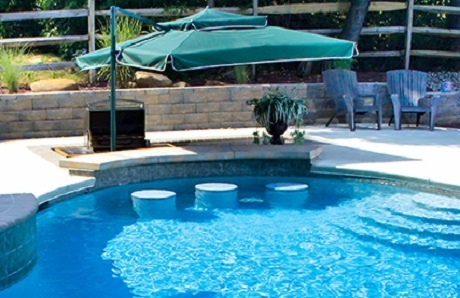 Style and functionality are important considerations for your swim-up bar’s design. However, when designing a swim-up bar, the first factor to keep in mind is a more practical one: available space. 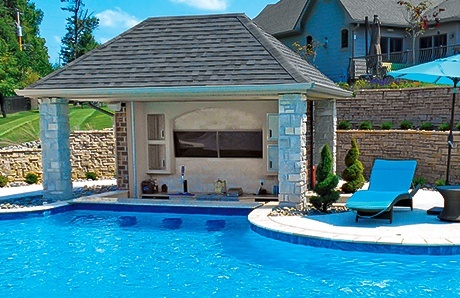 The size and shape of your backyard and the total square footage you are allocating to your new aquatic retreat will dictate how much area in your pool can be devoted to the swim-up bar area. Discuss this with your pool builder at the start of the design process. Whatever features for a swim-up pool bar meet your preferences for entertaining in style, know that this resort experience is relatively easy to add to most new concrete pools. But you have to ask your designer to include a swim-up bar in your initial project plan and spec out the price. Then get ready to toast to the good times you’ll spend in your backyard oasis. For some helpful ideas about options for your swim-up bar, here are 10 project photos showing a range of ways to integrate this resort-style feature into your pool and backyard’s overall design. 1. Built with style and functionality in mind, this project marries a swim-up bar with an outdoor kitchen. The “wet” side features a curved, concrete countertop, and three submerged barstools—each accented by a band of colored tile around their exterior. On the “dry” side, the pool owners enjoy a sunken walk-up pool bar with barstools, cooking area, and a retractable umbrella for shade. 2. 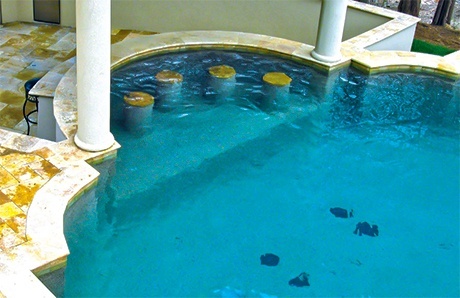 At one end of this classic-shape pool, Roman columns set off this semi-circular swim-up/walk-up pool bar. Four stools on the wet side of the bar are built on a raised shelf that sits higher than the pool floor. The bar countertop and barstool seats are topped with coordinating stone. On the dry side, a second countertop is built at a lower position to accommodate the seating for those outside the pool. 3. 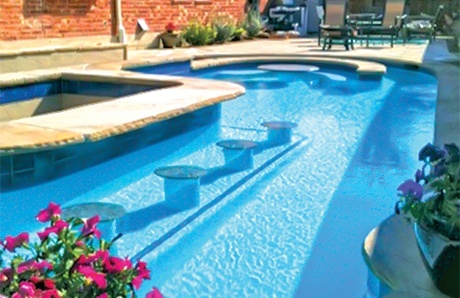 The ability to entertain and socialize in the water was the key driver in this pool design. A stone countertop services four barstools. This seating quartet is built on a raised floor shelf that is visually demarcated with tile to distinguish it from the pool floor. The dry side of the bar is sunken so that anyone on serving duty is lower and closer to swimmers seated on the submerged barstools. The bar’s location makes it easy for swimmer’s to grab drinks and snacks and wade just a few feet away to a nearby in-pool table-and-seating area. 4. The stone-topped perimeter of this pool includes a countertop that accommodates three barstools built on a raised shelf. The swim up bar extends directly into a spacious kitchen equipped with a barbecue grill, sink area, lots of cabinets, and plenty of island counter space. To cool guests when the sun is out, an arched wood pavilion covers the bar and kitchen. 5. Friends and family who swim-up to the four stools at this curved, stone countertop will have ample opportunities to socialize with those sitting in chairs on the dry side of the bar. A pavilion roof-structure offers ample protection from the sun for those relaxing at the swim-up bar, and it also provides shade for a sunken lounge setting on the dry side. 6. A tropical-style rock motif dominates the swim-up bar and kitchen—built using faux rock— on this large lagoon pool. The design takes swim-up bars to the next level with an elaborate “island” lounge area that includes four bar chairs, a separate table-and-chairs combo, and kitchen amenities for cooking and preparing meals. 7. 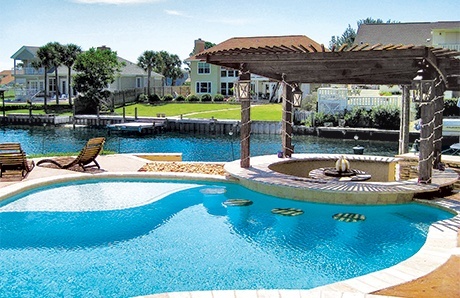 You could sit at this swim-up bar and wave to passing boats in the channel behind this backyard pool. On the dry side of the swim-up bar, a fire pit enlivens a circular lounge area, and wood pergola above blocks out some of the sun’s rays for those at the bar or in the lounge. 8. 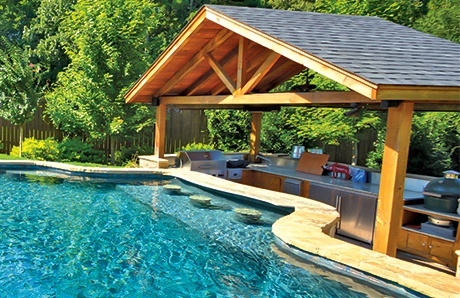 Yes, you can utilize space in your custom spa to build a “swim-up” bar! In this example, natural grey rock covers the barstool seats—coordinating with the grey countertop and spa spillway. The dry side of the spa’s straight bar countertop is sunken—allowing guests to pull chairs up for eye-to-eye conversations. Opposite the spa, people can enter the sunken area by descending a set of stairs leading from the higher deck area. 9. 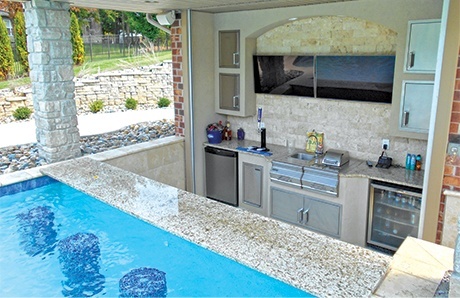 Your swim-up bar can be equipped with all the comforts of an outdoor kitchen. Barstools fully covered in dark-blue tile vividly accent the neutral colors in a modern kitchen with a sleek granite countertop. The sunken kitchen features a sink, color-matched subway tile backsplash, overhead cabinets for storing glasses and dishware, fully-stocked mini-fridge, drink chiller, and plenty of counter space. 10. 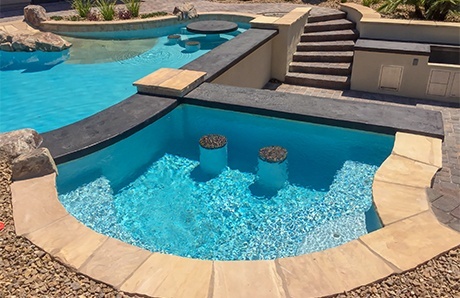 This swim-up bar with three seats and a curved granite countertop is built in the pool’s shallow end, which can be cost-effective: A shallow depth area is the ideal spot, as it avoids the added cost of building a platform to elevate stool height to reach the counter. On the dry side, a sunken grilling area—shaded with a portable umbrella—makes both conversation with and service to anyone at the bar convenient for everyone.